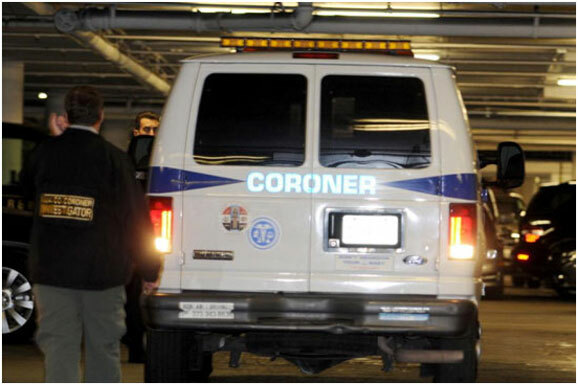 Too often people are found deceased in their home who have been there from a few days to even weeks or months. This type of unattended death scene cleanup and recovery work should only be left to an experienced company like Iowa CTS Cleaners. Our dedicated team of highly trained death scene cleaning professionals can safely and discreetly remedy any death scene involving decomposition, biohazardous or infectious wastes and dispose of it properly. Death Scene cleanup involves the use of protective equipment such as a respirator and biohazard suits. Specialty equipment for odors are normally required to remove odors from unattended death or natural death scenes cleaning. We highly advise people to not try to do this work yourself as further damages can occur to the property with the use of the wrong cleaning agents such as bleach. Iowa CTS Cleaners follows a proven death scene cleaning process that can guarantee horrible odors can be eliminated from a property caused from a natural death. 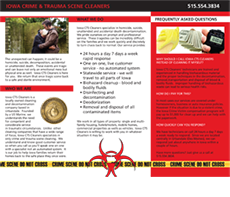 Owner John Krusenstjerna has safely and effectively decontaminated hundreds if not more scenes involving natural death decomposition cleaning and odor removal. If the process of recovering a scene from a natural death is not successful, odors will remain and bug issues from flies and maggots can remain constant. Iowa CTS Cleaners is your local death scene cleaning service with coverage extending the entire State of Iowa. Beware of death scene cleaning services that advertise locally but are not. Trust who you hire- HIRE local professionals that live and work in the area that depend on their reputation for continued service.